On September 17, 1967 the Atlanta Falcons traveled to Baltimore to begin their second season against the Colts. Coach Norb Hecker’s Falcons had gone 3-11 as a first-year expansion team in 1966, but all three of the wins came late in the year to give the enthusiastic fans hope for ’67. QB Randy Johnson started as a rookie, and took his lumps accordingly, but showed promise. Ex-Packer HB Junior Coffey performed well running the ball, and another prize rookie, MLB Tommy Nobis, quickly established himself as the key player on defense. The Falcons faced a formidable opening-week foe in the Baltimore Colts. Coached by Don Shula, they were typically one of the league’s better teams and coming off a 9-5 season. 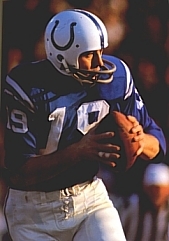 As he had been for a decade, 34-year-old QB Johnny Unitas (pictured above) was the key to the well-balanced offense. The defense was tough both up front – where they had made it even tougher by drafting Michigan State All-American DE Bubba Smith – and in the backfield. There were 56,715 fans in attendance at Memorial Stadium. 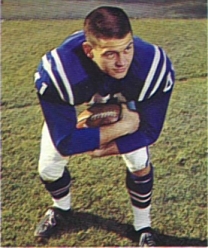 It looked easy for the Colts when, on the first play from scrimmage, Unitas connected with HB Tom Matte for an 88-yard touchdown. However, the Falcons tied the game quickly when DB/flanker Ron Smith returned the ensuing kickoff 99 yards for a TD. Both extra points were successfully added and the score stood at 7-7. Before the opening quarter was over, Lou Michaels kicked a 16-yard field goal to put the Colts back in front. In the second quarter, the Colts put together a 76-yard scoring drive. Unitas passed to flanker Jimmy Orr for 18 yards and, following a three-yard gain on a running play, connected with Orr again on a 55-yard bomb for a touchdown. CB Bobby Boyd picked off a Randy Johnson pass and returned it 30 yards for a TD to expand the margin to 24-7. The Colts weren’t done yet in the first half as Unitas passes to TE John Mackey set up a three-yard scoring run by FB Tony Lorick. Baltimore was up by 24 points at halftime and the lead appeared to be impregnable. Atlanta began to rally in the third quarter. An 82-yard drive ended with Johnson throwing a pass to TE Tax Anderson for a 21-yard touchdown. Later in the period Wade Traynham booted a 48-yard field goal to narrow Baltimore’s lead to 31-17. On the first play of the fourth quarter, the Falcons crept closer as CB Lee Calland intercepted a Unitas pass and returned it 77 yards for a touchdown. With the successful extra point, Atlanta was down by only 31-24. The Colts, who had been quiet thus far offensively in the second half, responded by driving 82 yards capped by Matte (pictured at left) running 10 yards for a TD. The Falcons didn’t fold, however, and a big play got them back down the field quickly. Johnson completed a pass to Ron Smith for a 60-yard gain to set up his own 17-yard scoring carry. With another successful PAT, the Falcons had pulled to within a touchdown of the Colts with two minutes left. There was not to be a big upset, however. Atlanta got the ball back for one last try but LB Mike Curtis finally sealed the 38-31 win for the Colts with an interception at the Baltimore 40. The Colts led significantly in total yards (508 to 303) and first downs (20 to 13) as two of Atlanta’s scores were not produced by the offense. The Falcons hurt themselves with five turnovers, which helped put them in their deep second quarter hole, as opposed to two suffered by Baltimore. Johnny Unitas broke his own franchise single-game passing yardage record (397 in 1959) as he completed 22 of 32 passes for 401 yards and two touchdowns with one interception. It would remain his career high. John Mackey had 8 catches for 126 yards and, with the long scoring play, Tom Matte added 99 yards on his two receptions to go along with a team-leading 36 yards on 10 rushing attempts that also included a TD. For the Falcons, Randy Johnson was successful on 18 of 29 throws for 217 yards and a TD but also tossed four interceptions. In addition, Johnson rushed for 39 yards and a touchdown on four carries, which also led the club. Junior Coffey was right behind as he ran for 38 yards on 13 attempts; he also caught 6 passes for another 20 yards. Ron Smith (pictured at right), with his one long reception, topped the team with 60 receiving yards. Added to his 139 kickoff return yards that included a TD and 22 yards on punt returns, Smith touched the ball 6 times for 221 total yards. Following the high-scoring Week 1 battle, the fate of the two teams diverged significantly. The Colts were tied twice but didn’t lose until the last week of the season – although the loss to the Rams was enough to deprive them of the Coastal Division title and a spot in the postseason despite an 11-1-2 record. The Falcons didn’t match their opening point total in any of their remaining games and, in fact, scored just 14 points in losing their next three games and the next time they met the Colts they lost 49-7. The final tally was 1-12-1 as Atlanta finished at the bottom of the division with the NFL’s worst record. Johnny Unitas went on to receive consensus league MVP honors as well as being a first-team All-NFL and, for the tenth time, Pro Bowl selection. He led the league in completion percentage (58.5) and ranked second in pass attempts (436), completions (255), and yards (3428). Ron Smith ranked fifth in the NFL in all-purpose yards with 1337, which included a league-leading 976 yards on kickoff returns. 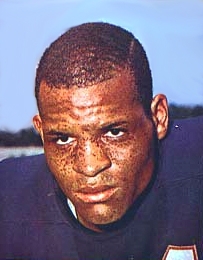 In the only season of his ten-year career in which he was used on offense, he caught 11 passes for 227 yards (20.6 avg.) and ran the ball 8 times for 42 yards.